Walter de CANTELOU-C2904 # was born in 1107 in Calne, Wiltshire. He died after 1155. M i Walter de CANTELOU-C2812 # was born in 1133. Robert II de EWYAS Lord of Ewyas Harold-E2802 #. Robert married Petronilla. Petronilla. Petronilla married Robert II de EWYAS Lord of Ewyas Harold-E2802 #. F i Sibyl de EWYAS-E2704 #. Geoffrey V d' ANJOU Comte d'Anjou et Maine [Parents] [scrapbook]-A3002 # was born on 24 Aug 1113. He died on 07 Sep 1151 in Château-du-Loir, France. He was buried in St Julien's Cathedral, Le Mans, France. Geoffrey married Matilda BEAUCLERC 'The Empress' of England-B3001 # on 22 May 1128 in Le Mans Cathedral, Le Mans, France. Geoffrey V de Anjou also went by the nick-names of Geoffrey 'the Fair' and by Geoffrey 'Plantagenet' (from the broom flower - planta genista - which he took as his emblem), hence the name of the line of English kings descended from him. He gained the title of 10th Count of Anjou in 1129. He succeeded to the title of 12th Duke of Normandy on 19 January 1144. He gained the title of Count of Maine. He abdicated as Duke of Normandy in 1150. Matilda BEAUCLERC 'The Empress' of England [scrapbook]-B3001 # was born on 07/07 Feb 1101/1102 in the Royal Palace, Sutton Courtenay, Berkshire. She died on 10 Sep 1167 in the Abbey of the Notre Dame des Prés near Rouen, Caux, France. She was buried in the Abbey church of Bec-Hellouin, Normandy, France. Matilda married Geoffrey V d' ANJOU Comte d'Anjou et Maine-A3002 # on 22 May 1128 in Le Mans Cathedral, Le Mans, France. Matilda of England was born about the 7th February 1101/2 and was the only surviving legitimate daughter of King Henry I of England and grandaughter of William I the Conqueror. She was married to Henry V, Holy Roman Emperor, and then to Geoffrey V, Count of Anjou by whom she became the mother of Henry II Curtmantle. Matilda was the first female ruler, although uncrowned, of the Kingdom of England. Her failure to secure that rule meant that her temporary and disputed period of reign in 1141 was extremely brief (April to November). She is often excluded from lists of English monarchs, listing Stephen of Blois as monarch from 1135-1154. As many of her contemporaries or near contemporaries were also called Matilda in Latin texts, she is sometimes called Maude to distinguish her. This is merely a modernised spelling of the Norman-French form of her name, Mahaut. 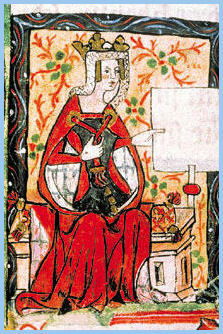 Matilda was born probably on 7 February 1101/2 to King Henry I of England and his wife Matilda of Scotland. Her maternal grandparents were Malcolm III of Scotland and Saint Margaret of Scotland. Margaret was a daughter of Edward the Exile and granddaughter of Edmund II of England.Her birth is generally said to have taken place at Winchester, though recent research by the late John Fletcher (1990) suggests it may have occurred at the royal palace at Sutton Courtenay (then in Berkshire). When she was seven years old, Matilda was betrothed to Henry V, Holy Roman Emperor, and was sent to the Holy Roman Empire in 1111 to begin her training as his consort. Matilda and Henry were married at Worms in Germany on 7th January 1114 in a splendid ceremony. In March 1116 Matilda and Henry visited Rome and Tuscany and she acted as Regent in his absence. When Henry V died in 1125, he left Matilda a childless widow of twenty-three. The Imperial couple allegedly had no surviving offspring. Hermann of Tournai states that Maud (Matilda) bore a child that lived only a short while. Matilda's brother, William Adelin, had perished several years before in the wreck of the White Ship, leaving Matilda the only legitimate heir to the English throne. Despite being known most popularly by the title of "Empress" due to her first marriage, Matilda's right to the title was dubious. She was never crowned Holy Roman Empress by a legitimate Pope (generally recognised as required to claim the title), only as German Queen by her husband's Bishops and formally her correct title was "Queen of the Romans". However, "Empress" was arguably an appropriate courtesy title for the wife of an Emperor who had been crowned by the Pope, and indeed, in later years she encouraged chroniclers to believe that the Pope had crowned her. Matilda returned to England, where her father named her his heir with the agreement of the Anglo-Norman barons, who swore (in 1127) to accept her as ruler if Henry I had no son, and arranged another marriage for her. On 17th June 1128, she was married again, at Le Mans in Anjou, to Geoffrey of Anjou, who was eleven years her junior. He was nicknamed "Plantagenet" from the broom flower (planta genista) which he took as his emblem, hence the name of the line of English kings descended from him. He was at this time Count of Maine and heir to his father Fulk V, Count of Anjou. The marriage was not a happy one, and Matilda separated from him and returned to her father. She returned to Geoffrey in 1131 and they were reconciled. They produced three sons, the eldest of whom, Henry (later King Henry II of England) was born on 5th March 1133. The birth of her second son, Geoffrey, Count of Nantes, in 1134, was difficult and Matilda nearly died in childbirth. Her third son, born in 1136, was William, Count of Poitou. King Henry I and Geoffrey quarreled, and so when her father died on 1st December 1135 in Normandy, Matilda was with Geoffrey in Anjou. On the death of her father, Henry I, Matilda expected to succeed to the throne of England, but her cousin, Stephen of Blois, a nephew of Henry I, usurped the throne with the support of most of the barons (who considered a woman unfit to rule), breaking the oath he had previously made to defend her rights. The civil war which followed was bitter and prolonged, with neither side gaining the ascendancy for long. It was not until 1139 that Matilda could command the military strength necessary to challenge Stephen within his own realm. Stephen's wife, the Countess of Boulogne who was also named Matilda, was the Empress's maternal cousin. During the war, Matilda's most loyal and capable supporter was her illegitimate half-brother, Robert of Gloucester (1st Earl of Gloucester). Matilda's greatest triumph came in April 1141, when her forces defeated and captured King Stephen at the Battle of Lincoln (1141). He was made a prisoner and effectively deposed. Her advantage lasted only a few months. When she marched on London, the city was ready to welcome her and support a coronation. However, she refused the citizens' request to have their taxes halved. On 24 June 1141, she found the gates of London shut and the civil war reignited. By November, Stephen was free, having been exchanged for the captured Robert of Gloucester, and a year later, the tables were turned when Matilda was besieged at Oxford but escaped to Wallingford, supposedly by fleeing across the snow-covered land in a white cape. In 1141 she had escaped Devizes in a similarly clever manner, by disguising herself as a corpse and being carried out for burial. In 1148, Matilda and her son Henry returned to Normandy, following the death of Robert of Gloucester, and the reconquest of that county by her husband. Upon their arrival, Geoffrey turned Normandy over to his son, and retired to his own county of Anjou. Not all hope was lost. Matilda's son, (Henry), was showing signs of becoming a successful leader. Although the civil war had been decided in Stephen's favour, his reign was troubled. In 1153, the death of his son Eustace, combined with the arrival of a military expedition led by Henry, led him to acknowledge the latter as his heir by the Treaty of Wallingford. Matilda retired to Rouen in Normandy during her last years, where she maintained her own court and presided over the government of the duchy in the absence of Henry. She intervened in the quarrels between her eldest son Henry and her second son Geoffrey, but peace between the brothers was brief. Geoffrey rebelled against Henry twice before his sudden death in 1158. Relations between Henry and his youngest brother, William, were more cordial, and William was given vast estates in England. Archbishop Thomas Becket refused to allow William to marry the Countess of Surrey and the young man fled to Matilda's court at Rouen. William, who was his mother's favourite child, died there in January 1164, reportedly of disappointment and sorrow. She attempted to mediate in the quarrel between her son Henry and Becket, but was unsuccessful. Although she gave up hope of being crowned in 1141, her name always preceded that of her son Henry, even after he became king. Matilda died at in Notre Dame du Pré near Rouen and was buried in the Abbey church of Bec-Hellouin, Normandy. Her body was transferred to the Rouen Cathedral in 1847; her epitaph reads: "Great by Birth, Greater by Marriage, Greatest in her Offspring: Here lies Matilda, the daughter, wife, and mother of Henry." M i Henry d' ANJOU King Henry II of England-A2903 # was born on 05 Mar 1133. He died on 06 Jul 1189. Geoffrey VI d' ANJOU Count of Anjou-A2904 was born on 01 Jun 1134 in Rouen, France. He died on 26 Jul 1158 in Nantes, France. He was buried in Nantes, France. William d' ANJOU Count of Poitou-A2905 was born in 1136. He died in 1164.  Robert de GREY [Parents]-G2801 # was born about 1127 in Rotherfield Greys, Oxfordshire. M i Henry de GREY-G2701 # was born in 1155. He died after 1224. John de GREY-G2702 was born about 1163 in Rotherfield Greys, Oxfordshire. He died on 18 Oct 1214 in Saint-Jean-d'Angély, Poitou, France. He was buried on 25 Oct 1214 in Norwich Cathedral, Norwich, Norfolk. John was a younger son of Robert de Grey of Rotherfield Greys in Oxfordshire and descended from the Norman knight, Anchetil de Greye He entered Prince John's service by 1196 and was keeper of John's seal by 1198. After John's accession in 1199 he was rapidly promoted in the church, becoming Archdeacon of Cleveland in March 1200 and Archdeacon of Gloucester before April 1200, then quickly being elected Bishop of Norwich in September 1200. He was elected about 7 September and was consecrated on 24 September. He also served as King John's secretary. In 1203 he went with Archbishop Hubert Walter of Canterbury on a diplomatic mission to King Philip II of France. He was instrumental in securing the selection of his nephew Walter de Grey, Archbishop of York, as Lord Chancellor (1215 to 1255). King John's attempt to force him into the primate's office of Archbishop of Canterbury in 1205 started the king's long quarrel with Pope Innocent III. After Hubert Walter's death in July of 1205 the selection of a successor was hindered by doubts about what the proper procedure should be. King John postponed a decision while delegations from both the bishops of England and the monks of the cathedral chapter went to Rome to seek guidance from the pope. However, while the delegations were in Rome, the monks of Canterbury decided to hold a secret election and elected their prior Reginald to be archbishop. Reginald was sent to Rome to join the delegation. When King John found out that the monks had elected someone without any regal input he forced the monks to elect John de Grey as archbishop. Some stories have the election of Reginald taking place before the sending of the first delegation to the curia. Another source, Gervase of Canterbury, has the king telling the chapter they could choose their own nominee after six months, while the king secretly sent envoys to Rome to secure the election of de Grey. John de Grey was postulated to Canterbury on 11 December 1205 and the nomination was quashed by Pope Innocent III about 30 March 1206, along with Reginald's claim. The monks then elected, with Innocent's approval, Stephen Langton. John de Grey was a hard-working royal official, in finance, in justice, in action, using his position to enrich himself and his family. In 1209 he went to Ireland to govern it as governor. He adopted a forward policy, attempting to extend the English frontier northward and westward, and fought a number of campaigns on the River Shannon and in Fermanagh. But in 1212 he suffered a great defeat in Fircal in County Offaly. He assimilated the coinage of Ireland to that of England, and tried to effect a similar reform in Irish law. During the interdict that Pope Innocent III placed on England during King John's reign, de Grey stayed in England and helped to govern the kingdom, even after the king was excommunicated, along with Peter des Roches, Bishop of Winchester. He was a good financier, and could always raise money: this probably explains the favour he enjoyed from King John. In 1213 he is found with 500 knights at the great muster at Barham Downs, when Philip Augustus was threatening to invade England. When John and the pope concluded the treaty where John gave England to the pope and received it back as a vassal, John de Grey was one of the witnesses to the treaty. After John's reconciliation with Innocent, de Grey was one of those exempted from the general pardon, and was forced to go in person to Rome to obtain it. In Rome he so completely gained over Innocent that the pope sent him back with papal letters recommending his election to the bishopry of Durham but he died at Saint-Jean-d'Angély in Poitou on his homeward journey on 18 October 1214. He was buried in Norwich Cathedral. William de WARENNE 2nd Earl of Surrey [Parents]-W3101 # was born about 1065. He died on 11 May 1138 in Lewes, Sussex. He was buried in the Chapter House, Lewes Priory, Sussex. William married Elizabeth de VERMANDOIS-V3101 # about 1118 in France. William de Warenne, 2nd Earl of Surrey (died 1138), was the son of William de Warenne, 1st Earl of Surrey and his first wife Gundred. He is more often referred to as Earl Warenne or Earl of Warenne than as Earl of Surrey. In January 1091, William assisted Hugh of Grantmesnil (d.1094) in his defense of Courcy against the forces of Robert de Belleme and Duke Robert. Sometime around 1093 he tried to marry Matilda (or Edith), daughter of king Malcolm III of Scotland. She instead married Henry I of England and this may be the cause of William's great dislike of Henry I, which was to be his apparent motivator in the following years. He accompanied Robert Curthose (Duke Robert) in his 1101 invasion of England, and afterwards lost his English lands and titles and was exiled to Normandy. There he complained to Curthose that he expended great effort on the duke's behalf and had in return lost most of his possessions. Curthose's return to England in 1103 was apparently made to convince his brother to restore William's earldom. This was successful, though Curthose had to give up all he had received after the 1101 invasion, and subsequently William was loyal to Henry. To further insure William's loyalty Henry considered marrying him to one of his many illegitimate daughters. He was however dissuaded by Archbishop Anselm of Canterbury, for any of the daughters would have been within the prohibited degrees of consanguinity. The precise nature of the consanguineous relationship Anselm had in mind has been much debated, but it is most likely he was referring to common descent from the father of duchess Gunnor. William was one of the commanders on Henry's side (against Robert Curthose) at the Battle of Tinchebray in 1106. Afterwards, with his loyalty thus proven, he became more prominent in Henry's court. In 1110, Curthose's son William Clito escaped along with Helias of Saint-Saens, and afterwards Warenne received the forfeited Saint-Saens lands, which were very near his own in upper Normandy. By this maneuver king Henry further assured his loyalty, for the successful return of Clito would mean at the very least Warenne's loss of this new territory. In 1118 William acquired the royal-blooded bride he desired when married Elizabeth de Vermandois. She was a daughter of count Hugh of Vermandois, a son of Henry I of France, and was the widow of Robert de Beaumont, 1st Earl of Leicester. He fought at the Battle of Bremule in 1119, and was at Henry's deathbed in 1135. William's death is recorded as 11 May 1138 in the register of Lewes priory and he was buried with his father at the chapter-house there. Elizabeth de VERMANDOIS [Parents]-V3101 # was born in 1085. She died on 13/13 Feb 1131/1132 in Lewes, Sussex. She was buried in the Chapter House, Lewes Priory, Sussex. Elizabeth married William de WARENNE 2nd Earl of Surrey-W3101 # about 1118 in France. Elizabeth de Vermandois, or Elisabeth or Isabel de Vermandois, is a fascinating figure about whose descendants and ancestry much is known and about whose character and life relatively little is known. She was twice married to influential Anglo-Norman magnates, and had several children (among whose descendants are numbered many kings and some queens of England and Scotland). Her Capetian and Carolingian ancestry was a source of much pride for some of these descendants (who included these arms as quarterings in their coats-of-arms. However, the lady herself led a somewhat controversial life. She was the third daughter of Hugh Magnus (a son of Henry I of France) and Adele of Vermandois. Her paternal grandparents were Henry I of France and Anne of Kiev. Her maternal grandparents were Herbert IV of Vermandois and Adele of Vexin. Her mother was the heiress of the county of Vermandois, and descendant of a junior patrilineal line of descent from Charlemagne. The first Count of Vermandois was Pepin of Vermandois. He was a son of Bernard of Italy, grandson of Pippin of Italy and great-grandson of Charlemagne and Hildegard. As such, Elizabeth had distinguished ancestry and connections. Her father was a younger brother of Philip I of France and her mother was among the last Carolingians. She was also distantly related to the Kings of England, the Dukes of Normandy, the Counts of Flanders and through her Carolingian ancestors to practically every major nobleman in Western Europe. In 1096, while under age (and probably aged 9 or 11), Elizabeth married Robert de Meulan, 1st Earl of Leicester. Meulan was over 35 years her senior, which was an unusual age difference even for this time period. He was a nobleman of some significance in France, having inherited lands from his maternal uncle Henry, Count of Meulan, and had fought bravely and with distinction at his first battle, the Battle of Hastings in 1066 then aged only 16. His parents Roger de Beaumont, Lord of Beaumont-le-Roger and Pont-Audemar and Adeline of Meulan, heiress of Meulan had died long before; Roger had been a kinsman and close associate of William the Conqueror. Meulan had inherited lands in Normandy after his father died circa 1089, and had also been given lands in the Kingdom of England after his participation in the Norman conquest of England. However, at the time of the marriage, he held no earldom in England while his younger brother was already styled Henry de Beaumont, 1st Earl of Warwick. Planche states that the bride (Elizabeth) agreed willingly to the marriage, although this means little in the context. Despite the immense age difference, this was a good marriage for its times. Meulan was a respected advisor to three reigning monarchs: William II of England, Robert Curthose of Normandy and Philip I of France. According to Middle Ages custom, brides were often betrothed young - 8 being the legal age for betrothal and 12 for marriage (for women). The young betrothed wife would often go to her husband's castle to be raised by his parents or other relatives and to learn the customs and ways of her husband's family. The actual wedding would not take place until much later. Some genealogists speculate that the usual age at which a noble bride could expect the marriage to be consummated would be 14. This is consistent with the date of birth of Elizabeth's first child Emma in 1102 when she would be about 15 to 17. The marriage produced several children, including most notably two sons who were twins (born 1104), and thus remarkable in both surviving and both becoming important noblemen. They are better known to historians of this period as the Beaumont twins, or as Waleran de Beaumont, Count of Meulan and his younger twin Robert Bossu (the Humpback) or Robert de Beaumont, 2nd Earl of Leicester. (Readers of Ellis Peters' Cadfael historical mystery series will find both twins mentioned frequently). Another notable child of this marriage was Elisabeth or Isabel de Beaumont, one of the youngest mistresses of Henry I of England and later mother (by her first marriage) of Richard Strongbow. Elizabeth, Countess of Meulan apparently tired of her aging husband at some point during the marriage. The historian Planche says (1874) that the Countess was seduced by or fell in love with a younger nobleman, William de Warenne (c. 1071-11 May 1138) himself the thwarted suitor of Edith of Scotland, Queen consort of Henry I of England. Warenne was said to want a royal bride, and Elizabeth fitted his requirements, even though she was also another man's wife. In 1115, the Countess was apparently carried off or abducted by Warenne, which abduction apparently concealed a long-standing affair. There was some kind of separation or divorce between Meulan and his wife, which however did not permit her to marry her lover. The elderly Count of Meulan died, supposedly of chagrin and mortification in being thus publicly humiliated, in the Abbey of Preaux, Normandy on 5 June 1118, leaving his properties to his two elder sons whom he had carefully educated. Elizabeth then married (secondly) William de Warenne, 2nd Earl of Surrey. By him, it is alleged, she already had several children (all born during her marriage to Meulan). She also had at least one daughter born while she was living out of wedlock with Warenne (1115-1118). It is unclear whether this daughter was Ada de Warenne, wife of Henry of Scotland or Gundrede de Warenne, wife of Roger de Beaumont, 2nd Earl of Warwick (her half-brothers' first cousin). The later life of Elizabeth de Vermandois is not known. Her sons by her first marriage appear to have a good relationship with their half-brother William de Warenne, 3rd Earl of Surrey although on opposing sides for much of the wars between Stephen and Matilda. Her eldest son Waleran, Count of Meulan was active in supporting the disinherited heir William Clito, son of Robert Curthose until captured by King Henry. He was not released until Clito's death without issue in 1128. Her second son Robert inherited his father's English estates and the earldom of Leicester and married the heiress of the Fitzosbern counts of Breteuil. Her daughter Isabel however became a king's concubine or mistress at a young age; it is unclear whether her mother's own life or her eldest brother's political and personal travails in this period played any part in this decision. Before her mother died, Isabel had become wife of Gilbert de Clare, later (1147) Earl of Pembroke, so had adopted a more conventional life like her mother. M i William de WARENNE 3rd Earl of Surrey-W3001 # was born in 1118. He died on 08/08 Jan 1147/1148. F ii Ada de WARENNE-W3004 was born about 1120. She died in 1178. Gundrada de WARENNE-W3005 was born about 1122 in Warwick, Warwickshire. She died after 1165 in Warwickshire. Gundrada de Warenne, married first Roger de Beaumont, 2nd Earl of Warwick, and second William, lord of Kendal. She is most remembered for expelling king Stephen's garrison from Warwick Castle. Reginald de WARENNE-W3002 died after 1170. Reginald de Warenne, who inherited his father's property in upper Normandy, including the castles of Bellencombre and Mortemer. He married Adeline, daughter of William, lord of Wormgay in Norfolk, by whom he had a son William (founder of the priory of Wormegay), whose daughter and sole heir Beatrice married first Dodo, lord Bardolf, and secondly Hubert de Burgh; Reginald was one of the persecutors of Archbishop Thomas in 1170. William de WARENNE 1st Earl of Surrey-W3201 # was born about 1045. He died on 24 Jun 1088 in Lewes, Sussex from from wounds he received at the Siege of Pevensey while helping suppress the Rebellion of 1088. He was buried in the Chapter House, Lewes Priory, Sussex. William married Gundred about 1064. 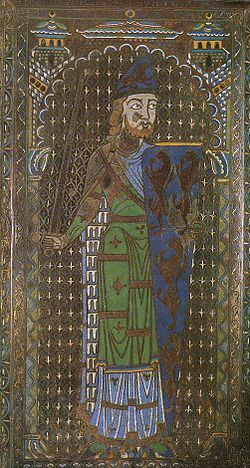 William, came from Normandy, and was a distant cousin of William the Conqueror (his grandmother having been the sister of Gunnora, wife of Richard I. of Normandy). He received large grants of land in recognition of the distinguished part he took at the battle of Hastings. He had large grants of land in several counties among which were the barony of Lewes, in Sussex, and the manors of Carletune and Benington, in Lincolnshire. So extensive indeed were those grants that his possessions resembled more the dominions of a sovereign prince than the estates of a subject. He enjoyed, too, in the highest degree, the confidence of the king, and was appointed joint Justice-General, with Richard de Benefactis, for administering justice throughout the whole realm. While in that office, some great disturbers of the public peace having refused to appear before him and his colleague, in obedience to citation, the Earl took up arms, and defeated the rebels in a battle at Fagadune, when he is said, for the purpose of striking terror, to have cut off the right foot of each of his prisoners. Of these rebels, Ralph Wahir or Gauder, Earl of Norfolk, and Roger, Earl of Hereford, were the ringleaders. He was likewise highly esteemed by King William Rufus, and in 1088 was created by that monarch the first Earl of Surrey. William lived in Bellencombe, Seine Inferieure, France for a time. Both William and his wife Gundrada chose to be buried in Lewes Priory. St. John's Chapel received the remains of William & Gundred de Warren after their lead coffins were discovered by railway workmen digging on the site of the Priory chapter house. On the floor of the Chapel rests the exquisite Gundrada tombslab of 1160 carved in black Tournai marble with great skill by Flemish master-craftsmen. Decorative features include palmettes and animal heads with a running inscription starting from a Greek cross at the top which bisects the slab lengthwise. Gundred died on 27 May 1085 in Castle Acre, Norfolk. She was buried in Lewes Priory, Sussex. Gundred married William de WARENNE 1st Earl of Surrey-W3201 # about 1064. Gundred died in childbirth 27th May 1085 at Castle Acre Norfolk where the family had built a Cluniac priory, and was buried in the Priory of Lewes in Sussex. Four of her children matured: William Son & Heir, Reginald, Gundred, and Edith. M i William de WARENNE 2nd Earl of Surrey-W3101 # was born about 1065. He died on 11 May 1138. Edith de WARENNE-W3102 was born in From 1070 to 1074. Reynold de WARENNE-W3103 was born about 1082. He died before 1118. Edward HOWSON [Parents]-H0402 # was born in Aug 1850 in Little Bolton, Lancashire. He died 1 about May 1922 in Blackburn, Lancashire. Edward married 2 Ellen BARKER about Aug 1911 in Blackburn, Lancashire. Edward was recorded in a census 3 on 30 Mar 1851 at 5, Back Lane Street, Little Bolton, Lancashire. He was recorded in a census 4 on 08 Apr 1861 at 33, Starkie Street, Blackburn, Lancashire. He was recorded in a census 5 on 03 Apr 1881 at 100, Oxford Street, Blackburn, Lancashire. He was recorded in a census 6 on 05 Apr 1891 at 100, Oxford Street, Blackburn, Lancashire. He was recorded in a census 7 on 31 Mar 1901 at 201, Higher Audley Street, Blackburn. He was recorded in a census on 02 Apr 1911 at 4, Walter Street, Blackburn, Lancashire. Ellen BARKER died in ?. Ellen married 1 Edward HOWSON-H0402 # about Aug 1911 in Blackburn, Lancashire. No reference number has been assigned to Ellen because Barker may not be her birth surname. The fact that Edward was 61 and a widower when they married could suggest that Ellen was also a widow. Sir John le STRANGE 2nd Lord Strange of Blackmere [Parents] 1, 2-S2302 # was born on 25/25 Jan 1305/1306 in Blackmere, Shropshire. He died on 21 Jul 1349. Sir married Ankaret le BOTELER-B2306 # before 20 May 1327. Second Lord Strange of Blackmere, of Whitchurch (in Blackmere), Corfham (in Diddlebury), Wrockwardine, Sutton Maddock and Cheswardine in Shropshire; Badgeworth in Gloucestershire. He was summoned to Parliament from 23rd Oct 1330 to 20 Apr 1344 by writs directed Johanni Lestraunge, and on 1 Jan and 10 Mar 1348/9 by writs Johanni Lestraunge de Blakemere. He was granted free warren in his demesne lands at Whitchurch, Corfham, Wrockwardine, etc in Shropshire and other places. He fought in Scotland in 1335 and 1336, in France 1342, 1345 and 1347. In 1346, he accompanied the king to Normandy and was present at Crećy and Calais. Ankaret le BOTELER [Parents] 1, 2-B2306 # was born about 1312 in Wem, Shropshire. She died on 08 Oct 1361 in Fairstead, Essex. Ankaret married Sir John le STRANGE 2nd Lord Strange of Blackmere-S2302 # before 20 May 1327. Her maritagium included the manor of Dodington, Shropshire. Fulk le STRANGE 3rd Lord Strange of Blackmere-S2204 died about 1349. M ii Sir John le STRANGE 4th Lord Strange of Blackmere-S2203 was born about 19 Apr 1332. He died on 12 May 1361. F iii Eleanor le STRANGE-S2202 # was born in 1337. She died on 20 Apr 1396. Sir Fulk STRANGE Lord of Blackmere [Parents] 1-S2401 # was born about 1267 in Longnor, Shropshire. He died on 23/23 Jan 1324/1325. Sir married Eleanor GIFFARD-G2403 # about 1296. Eleanor GIFFARD [Parents]-G2403 # was born about 1275 in Brimpsfield, GLO. She died before 23/23 Jan 1324/1325. Eleanor married Sir Fulk STRANGE Lord of Blackmere-S2401 # about 1296. M i Sir John le STRANGE 2nd Lord Strange of Blackmere-S2302 # was born on 25/25 Jan 1305/1306. He died on 21 Jul 1349.